People often ask me: can’t you do something for school kids? Or for parents or teachers? And now, all I have to do is refer them to Trees’ inspiring books. 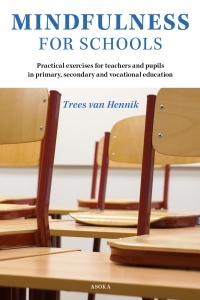 Mindfulness for schools presents brief, useful mindfulness exercises for teachers and pupils in primary, secondary and vocational education. Mindfulness is our innate capacity to be attentive to what we do, think and feel without giving an immediate reaction. Many pupils experience stress, feelings of isolation, insecurity and fear of failure. Integrating mindfulness helps create moments of stillness to remain balanced. In many countries, mindfulness is already part of the curriculum: it is a concrete tool to improve concentration and prevent stress. The exercises take 1 – 10 minutes. For years, Trees van Hennik was a manager and educator in a large mental healthcare organisation. She gave preventive courses n stress reduction, burnout and other mental problems. She is a mother, educator and qualified mindfulness trainer. In 2008 she founded Mindstudio, a centre for mindfulness, psychotherapy and coaching of children. She is also a teacher with Yoga Minds.